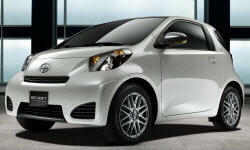 Scion iQ Pros and Cons | Page 1 of 1 | Why Not This Car? What drives people to buy (or not buy) a certain car? TrueDelta's members share Scion iQ pros and cons based on their real-world driving experiences. Small but very unique looking car. Guaranteed you'll get looks in this car. The IQ has extremely responsive steering and handling. I recently avoided an accident with a large 4 X 4, and was impressed with the car's maneuverability.